Dr. Muhammad A. Alam is known for important, innovative contributions that have overcome technological bottlenecks in various aspects of device technology. His work has laid the foundations for breakthroughs in semiconductor, electronic and opto-electronic device performance. While at Bell Laboratories in Murray Hill, New Jersey, and Agere Systems in Allentown, Pennsylvania, Dr. Alam pioneered the use of computational models to show the gate insulator of CMOS transistors could be reliably scaled down to at least 1.5 nm, allowing for faster integrated circuits without damaging the insulation. Also at Bell, he also led the development for a 3-D MOCVD vapor phase diffusion model that simulated the production of complex epitaxial structures for optoelectronic integrated circuits. This simulator dramatically reduced design time from several months to a week, and required the services of one engineer working with a computer rather than a team of opto-electronics experts. 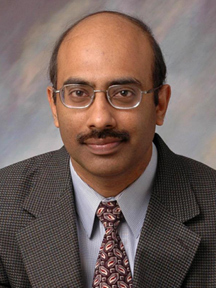 In 2004, Dr. Alam joined Purdue University in West Lafayette, Indiana, as a professor in School of Electrical and Computer Engineering. At Purdue, Dr. Alam and his colleagues have created a unified model for predicting the reliability of new silicon transistor designs, which is expected to save tens of millions of dollars in testing costs each year. The model is the first to analyze simultaneously the reliability of two types of transistors essential for CMOS computer chips. He has also led Purdue’s efforts to develop novel computational models for a new class of nanocomposites based on bundles of silicon nanowires or carbon nanotubes that could change the way large-area displays and sensors are made and deployed. This page was last edited on 8 February 2016, at 17:58.